A strong performance for tech led to a nearly 1% surge in the NASDAQ on Wednesday. Meanwhile, trade issues remain a positive as the U.S. looks to bring Canada into the recent agreement with Mexico. In other words, stocks had plenty of reasons to continue rallying as they look to close out August on a rising tide. Big upgrades from Morgan Stanley on Amazon (+3.38%) and Alphabet (+1.47%) led the tech upsurge. (AMZN is now at an all-time high just below $2000 per share and looking to become the next American company worth $1 trillion.) The NASDAQ jumped 0.99% today (or nearly 80 points) to 8109.7. The S&P also got a boost from tech and finished above 2900 for the first time in its history. It gained 0.57% to 2914.04. The NASDAQ and S&P have now reached all-time highs for four consecutive sessions. The Dow rose 0.23% to 26,124.6. You can bet that this index is much more interested in the trade discussions between the U.S. and Canadian Foreign Minister Chrystia Freeland. The discussions bore nothing concrete on Wednesday, but the mood between the two countries seems rather optimistic. On Monday, the U.S. and Mexico worked out a trade agreement and now everyone is trying to get Canada under the umbrella in what would amount to an update of NAFTA (though President Trump doesn’t like that name). Both sides think something could be worked out by Friday. It’s too bad the U.S. doesn’t have such good vibes with China! A real deal would be yet another positive for this strong U.S. economy. In fact, we received a reminder today on our solid situation when the second-quarter GDP was revised upward to 4.2% from 4.1%. It remains the best reading in nearly 4 years. Healthcare Innovators: There’s been a lot of good biotech news lately, including bluebird bio (BLUE) partnering with Gritstone Oncology to incorporate artificial intelligence (AI) in developing cancer cell therapies. The portfolio sold BLUE earlier this month for a more than 66% profit because there didn’t seem to be many short-term catalysts. But now it appears that support at $150 will hold, so Kevin jumped back into the name just as he said he might. The editor is also getting back into CRISPR Therapeutics (CRSP), which was sold late last month for a return of more than 9%. The move higher in biotech this week has Kevin wanting back into what he calls “the most-favored player in the health technology of the future”. Read the full write up for more on these latest picks, including suggested buy ranges for both. Technology Innovators: It can be hard to say goodbye to stocks that are performing well, but Brian Bolan needs room for the next round of winners. Therefore, he sold The Trade Desk (TDD) on Wednesday for a 13.1% return in less than a week and also got out of Evertec (EVTC) for an 11.4% profit in a bit over three months. TDD is a provider of a technology platform for advertising, while EVTC is in the payments industry. Each were added after strong quarterly reports. Be ready for a new trade tomorrow. Momentum Trader: Ever since beating the Zacks Consensus Estimate by 50% in its August 7 report, shares of Workiva (WK) have been on a “big-time breakout”. This cloud-based finance and accounting software company is blasting through resistance levels and making new 52-week highs. Dave says this stock could get to $40 in a hurry if this continues. Therefore, it’s a perfect holding for the portfolio, so the editor bought WK on Wednesday with a 12.5% allocation. To make room, he sold Radware (RDWR) for a 1.7% return. Read the full write-up for more. Home Run Investor: As mentioned yesterday in Stocks Under $10, Brian Bolan thinks the chips stocks are getting hot again. Therefore, he stuck with that area today by adding Nova Measuring Instruments (NVMI), a Zacks Rank #2 (Buy) maker of monitoring and measurement systems for semiconductor manufacturing. The company has an excellent history for beating the Zacks Consensus Estimate, amassing an average surprise of 21% over the past four quarters. The most recent beat was 9.5%. The editor wouldn’t be surprised to see NVMI trading above $33 by the end of October as money moves back into this space. The full write-up has more on this new pick. Options Trader: "Seems like just a few short months ago plenty were wringing their hands over a potential trade war. (Not me.) The tariffs were never put on as protectionist measures. Just the opposite. They were put on to move our trading partners to the negotiating table to craft a better deal which would lower taxes and tariffs and give everyone greater access to each other’s markets. "Yes, there was some short-term pain. Still is until the ink dries. But the end result is worth it for all parties involved. And the market is cheering this on. "Since stocks were artificially held down earlier in the year because of the tariff/trade talk uncertainty, the resolution of these trade issues is uncapping the market and they are rallying in earnest. 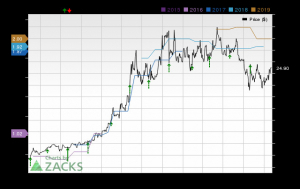 Nova (NVMI) to Report Q3 Earnings: What's in the Offing?